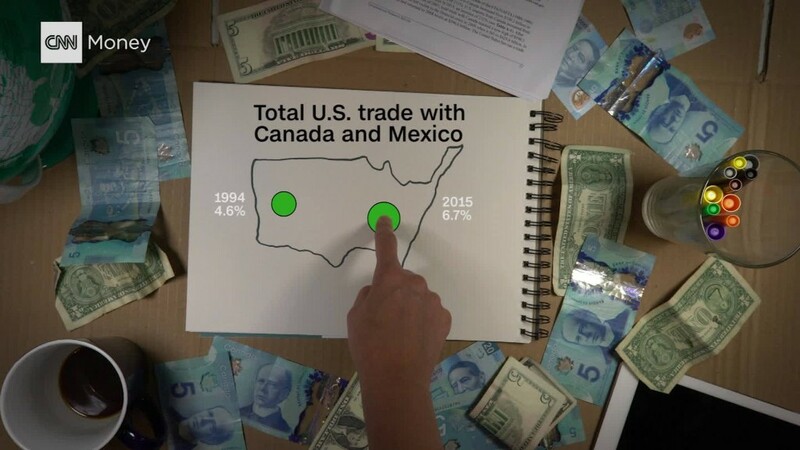 America and Canada have one of the world's biggest trade relationships. President Donald Trump met for the first time Monday with Canada's Prime Minister Justin Trudeau. "We have a very outstanding trade relationship with Canada," Trump said at the news conference. Listening to Trump, you might think Mexico is the bad actor of NAFTA. But since NAFTA's inception in 1994, there have been 39 complaints brought against Canada, almost all by U.S. companies. Known in the industry as the investor state dispute settlements, it allows companies to resolve cases under a special panel of NAFTA judges instead of local courts in Mexico, Canada, or the U.S. The World Trade Organization ultimately sided with Canada, denying America's claim and the two sides came to an agreement in 2006 to end the tariff. However, that agreement and its ensuing grace period expired in October, and the two sides are back at it again. The Obama and Trudeau administrations couldn't reach a compromise before Obama left office and it remains a contentious trade issue with U.S. lumber companies calling once again for tariffs. --Editor's note: This story was originally published on August 11, 2016. We have since updated it.